Preheat the oven to 130C/Gas Mark 2. Cut the venison into 3cm cubes, discarding any gristle and sinew. Heat 1 tbsp oil in a flameproof casserole dish. 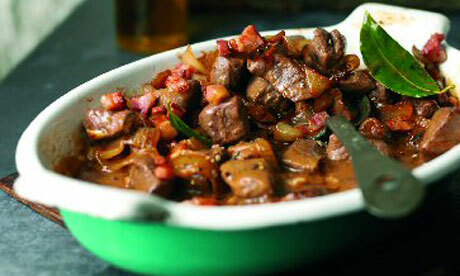 Fry the venison in batches for 5–6 mins until browned on all sides, adding a little extra oil as necessary. Transfer to a plate with a slotted spoon. Add onions to the casserole and fry for 2–3 mins, stirring occasionally until lightly browned, add the bacon and fry for a further 2 mins. Return all the meat and any accumulated juices to the pan. Add the garlic then stir in the flour. Gradually stir in the stock and ale, scraping up any juices stuck to the bottom of the pan. Heat, stirring until simmering. Add the sugar, bay leaves and thyme and season with freshly ground black pepper. Cover the casserole with a tight fitting lid or foil and cook in the oven for at least 2 hours or until the meat is tender.